Newly returned to her home in Mayfair, Lady Emily Hargreaves is looking forward to enjoying the delights of the season. The delights, that is, as defined by her own eccentricities—reading The Aeneid, waltzing with her dashing husband, and joining the Women’s Liberal Federation in the early stages of its campaign to win the vote for women. But an audacious vandal disturbs the peace in the capital city, splashing red paint on the neat edifices of the homes of London’s elite. This mark, impossible to hide, presages the revelation of scandalous secrets, driving the hapless victims into disgrace, despair and even death. 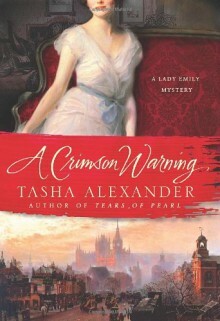 Soon, all of London high society is living in fear of learning who will be the next target, and Lady Emily and her husband, Colin, favorite agent of the crown, must uncover the identity and reveal the motives of the twisted mind behind it all before another innocent life is lost. Really good; one of my favorite Lady Emily books, if not THE favorite.Love the relationships among Colin, Emily and Jeremy. Where the heck was Robert in this one? And Ivy...I find boring.